Since Ponce de León first discovered it in 1513, Florida has attracted people for its beautiful weather, beaches and lush scenery. When most of us think of the Sunshine State, we think of all that - along with oranges, "Miami Vice" and of course, all those family-friendly resorts like Disney World. But there's so much more to experience in Florida, and here are 20 of the coolest things to check out. This St. Augustine masonry fort is the oldest in America, dating back nearly 350 years. Within its walls are the memories of the Spanish, British, African American, Native American and other cultures that helped forge our nation. Plus, there are cool cannons! It's famous for the natural sponges retrieved from the sea - and the Greek community that sprung up around that industry. Besides the opportunity to go sponge diving (or just take a tour to see how it's done), you can enjoy some of the best Greek food anywhere in America. It's the largest subtropical wilderness area in America, and the second largest national park (after Yellowstone). Canoeing, kayaking, hiking, bird watching and fishing are all popular activities - but the most fun is taking an airboat ride around some of its million-plus acres. Located in Miami, it's the former winter home of billionaire businessman James Deering (International Harvester). Formal gardens, more than 2,500 pieces of art - it's so impressive that its played host to members of royalty. The glass-bottom boat tours are Florida's oldest attraction and have lost none of their appeal. Besides getting a fantastic look at the underwater flora and fauna, you'll glide over things like sunken boats and artifacts from when Hollywood used the springs for movie shoots. The Plantation on Crystal River offers a fun package that lets you dive for scallops - then have them cooked for your dinner. Scallops live in three to eight feet of water, so snorkeling is the easiest way to nab them. Plus, you can stay cool, all at the same time. This 7,000-acre state park is just outside of Orlando - and a prime spot for cooling off on a hot summer's day. You can take a guided canoe tour - or just skip it and plunge into the icy waters of the springs. These gentle creatures are beloved in Florida, and there are several places where you're allowed to passively observe them in their watery home. Check out manatee tours to learn where you can snorkel alongside of them. This marvelous place features four floors of engaging exhibits, big-screen movies and more that makes learning new things actually fun. Locals know this is a great place to bring the kids - or bored adults - on a rainy day. From early October to mid-November, Disney's Epcot Center hosts this popular festival. Celebrity chefs cook up their specialties, there are beer and wine tastings/seminars, concerts and more. It's the happiest place on earth for foodies. The super-popular three-day festival in October attracts dozens of up-and-coming artists, along with big names. There are also fun after-parties at local bars and restaurants, and best of all, the event raises tons of money for local charities. "Kitetober" is one of Miami's biggest fall events. Whether you want to learn to build one, watch experts zig and zag or try your skill in a kite-flying competition, be prepared to keep your eye on the sky! 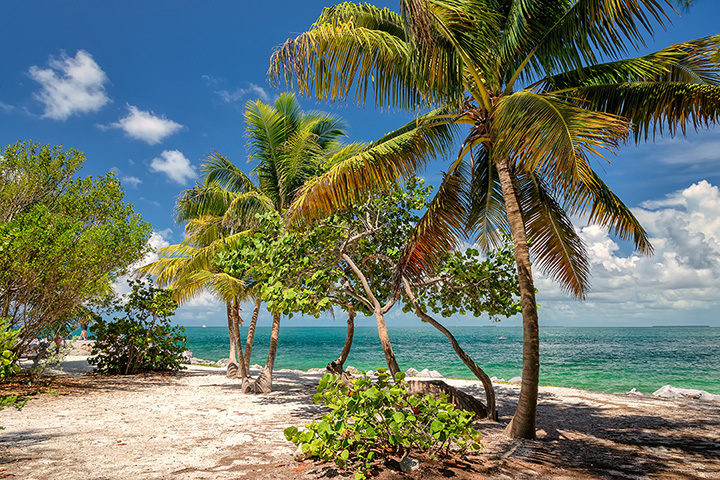 This strong of islands stretches 120 miles off Florida's tip, and offer incredible opportunities to fish, scuba dive and snorkel, go boating - or just hit one of many laid-back bars in Key West. It's the lifestyle made famous by Jimmy Buffet. For over a decade, Hemingway lived and wrote in this Key West home, and it still features some original furnishings (and a bookstore, of course). Perhaps the most famous feature are the 40-50 descendants of a six-toed (polydactyl) cat "Papa" was given back in the day - they call the property home and are cared for by staff. Florida is known for its oranges. So bypass that carton of juice and head to any one of dozens of groves that will let you pick a fresh one right off the tree. You'll forget that it's winter once you take a bite. One of the nation's most important sites for space flight is worth a visit. Bus tours help cover the 140,000 acres in Titusville. Inside are incredible displays of rocketry, fantastic IMAX movies and you can even meet a real astronaut. Or three. The Big Top comes alive in this fantastic museum in Sarasota. Not only are there miniature displays, there are also many historic artifacts. If clowns scare you, there's another building devoted to the family's massive (and world-class) art collection - and the mansion that you can explore. Before the Daytona National Speedway was built in 1959, this important race was run along the hard-packed sand of the beach. Kicking off the racing season in February, it's considered one of the premiere NASCAR cup events.